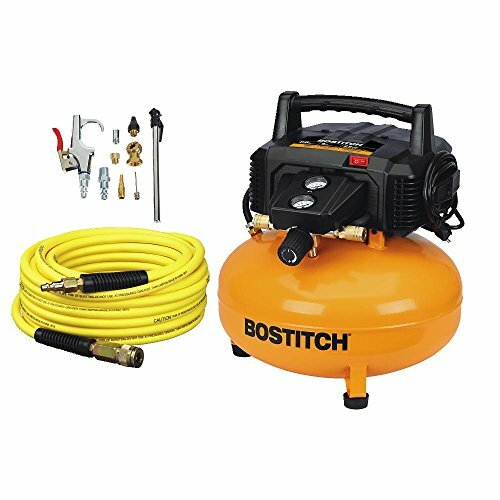 The Bostitch BTFP02012 6 Gallon 150 PSI Oil-Free Compressor is portable and lightweight. It features an oil-free, maintenance-free pump that delivers 2.6 SCFM* @ 90PSI and a maximum tank storage of 150 PSI for long tool run time with quick recovery. The 80 DBA** rating is ideal for a quiet work environment. It has a BOSTITCH high efficiency motor for easy start up in cold weather or extension cord application [14 ga or larger, 50 ft. (15.2 m) or less]. BOSTITCH high flow regulator and couplers to maximize air tool performance. It has two universal couplers to easily support two users. This kit includes a 50' Air Hose, along with an Inflation and Blow Gun Accessory Kit. Specs: Max Tank Storage PSI = 150, Electric Power Supply, Oil-Free pump, SCFM @ 90 PSI = 2.6, Tank Size = 6-gallon. OIL-FREE: Requires no daily maintenance and eliminates risk of oil stains on work surfaces. LIGHTWEIGHT: 29 lb. weight and narrow tank diameter make unit easy to carry/store. KIT INCLUDES: BTFP02012 Pancake Compressor, 50' Rubber/PVC Blend Air Hose, 10 Piece Inflation and Blow Gun Accessory Kit.